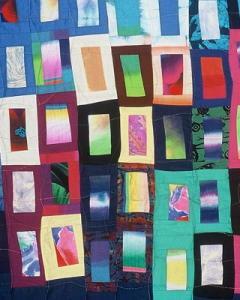 What to Look for When Choosing a Photo for Inspiration to Make a Quilt » What's Under the Needle? As all good detectives know (beginning with dear old Sherlock of course! ), it’s a great help to eliminate things. Narrow the field to the likely candidates. If the reason that you chose the inspiration picture is totally based on any of the following, and nothing else, then I would eliminate it. Color is not important at all – any color can be changed. Keep the gorgeous colored pictures in a separate “color inspiration” folder. Value isn’t important, you can develop a strong value pattern on any background. E.g. a white wall can have all sorts of enticing shadows cast upon it…a sky can have clouds and nuances, stacks of white boxes can have light, reflected light, cast shadow, shadowed sides, side horizontal to the light source, side vertical to the light sources…. I don’t even think Texture is the key, since you can add it too…unless your piece was all about a specific texture in which case I could definitely see beginning with it…. Subject too is largely immaterial – a good artist can make an interesting design out of any subject, in fact, that’s one of the important things about art – helping us see the beauty and design that can exist anywhere. The same is true of poetry: think about the poem by Rose Fylman that we all knew as kids: It begins: “I think mice are nice”!! Size – I have not found the size of the source material to be of any concern, small images can be enlarged, large ones made small. Medium: again no problem, designs can be developed based on any medium that you can translate into a simple sketch: photos, paintings, fiber art, sculptures, theater…film, tv. Incoherent jumbles of many different random objects can work: using your crop tools (the picture mat cut in half), you can find some areas that will work, but I wouldn’t recommend trying to copy something like that as a whole – so always use your crop tools when a big picture with a lot in it is your initial inspiration. So, having taken out all the photos that related more to the above concepts, what does that leave us? ?